Janmastami is approaching. Preparation is in full swing. My lectures are also warming up to Krsna’s pastimes. Again we will concentrate on Bhumi, the planet earth, who in the form of a cow approached Lord Brahma in great distress due to being overburdened by the sinful behavior of demoniac of many demoniac kings. Compassionately Lord Brahma accompanied by all the demigods will proceed to the shore of the ocean of milk where lord Visnu lies on a bed of Sesa Naga. In response to prayer the Lord will transmit a message which is only heard by Brahma, that soon He will appear in this world and that in preparation all the demigods should take their birth in the Yadu dynasty. Later after Krsna has appeared and has performed many childhood pastimes killing many demons. 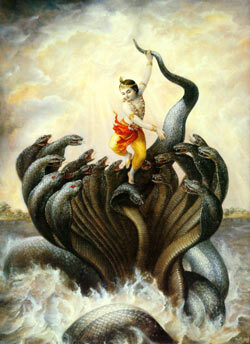 Kamsa lives in fear of Krsna due to the omen that he will be killed by the 8th son of Devaki. Finally Krsna goes to Mathura to the wrestling match where also Kamsa meet his end. On the way Krsna meets Kubja, a hunchbacked young woman with a beatiful face, who is attracted towards Krsna in a lusty way. Krsna pulls the body of Trivakra, the three curved one, and makes her straight and beautiful. It is stated that Kubja is actually the earth, an expansion of Satyabhama the personification of the Bhu Sakti of the Lord. Thus within this pastime Krsna is actually restoring the earth to it’s orginal glory. In his book Sri Caitanya Siksamrta Srila Bhaktivinode Thakura has listed all the demons that have been killed by Krsna and Balarama and he explains how each of these demons embody various demoniac anarthas that may be found in the hearts of the conditioned soul. A devotee should make a serious effort to free himself from these anarthas, so that he becomes eligible to enter in to the eternal pastimes of Krsna and become a resident of the spiritual world. Besides taking the pastimes of Krsna in this introspective way, where we try to overcome our own anarthas, we can also just look at the pastimes directly and learn many things. For example think of Kaliya , the powerful, poisonous manyhooded serpent king. Think of how the residents reached the maximum of emotional intensity that they could bear when they saw Krsna in the coils of that serpent for what appeared to be an endless time, how shocked and amazed were they, when Krsna suddenly freed Himself and started to dance on the hoods of Kaliya. Nobody could believe it, one moment a situation of total disaster, which took everyone to the utmost anxiety and next moment He is dancing as Vrndavana natabara, the most elegant dancer of Vrndavana on the hoods of the serpent. This is our playful Supreme Lord, who play with the hearts of His devotees.